I really enjoyed painting this piece. Not only I love working with watercolours but it was also a perfect excuse to watch the whole trilogy once again. So, here it is Nazgul crossing the Ford of Bruinen Enjoy! The composition is outstanding. I love the way you used the directional movement of lines leading your eye from the horses legs in the bottom right up to the top left following by the man's harsh sword to the top right. Though I do like the colour palette a lot, I think their needs to be more separation from the figure and the background. The figure would pop out a lot more if the background was a lot darker in general. The man on the figure is very well done but I think there is room for improvement on the horse. Particularly In the jaw area near the reigns some more definition is needed. I do really like how you used white lines and form to make up your image, and the foggy appearance of trees in the top background adds a very nice touch to the atmosphere of the entire image. The image overall is very well done. 192 out of 203 deviants thought this was fair. So as to not repeat what the other critiques say...I will add these words. The overall composition is phenomenal. The exagerrated size issues of the horse actually work quite nicely with the splashes to give the observer the sense that the Nazgul and mount are about to be leaping from the page. The color choices give the entire piece a "other-worldly" quality that I really like. The barren trees in the background, along with the strong use of blues and other cool colors give me the sense that this is from another scene that was filmed in a winter landscape. I really like that. 171 out of 181 deviants thought this was fair. This is incredibly beautiful! Great work. What technique did you use? I love LOTR! I actually read the trilogy for a book report. It was awesome, and so were the movies! But, I don't like Shelob, that spider. Great job on this! This piece is filled with drama and movement, I love it. This is quite an accomplishment on DA. 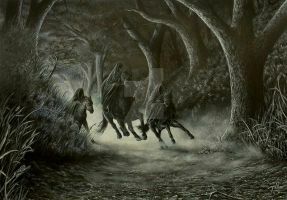 It's well drawn, and the action is palpable, but Tolkien did say that the Nazgul only rode black horses, many of them stolen from the Rohirrim. And, of course, The Nazgul never did cross the Bruinen, being caught in an Elvish caused flood. Brilliant! I love watercolor paintings! Plus, I'm a huge Tolkien fan! Keep up the great work! So amazing art work! I love the coloring and the emotions in it! a beautiful rendering of the scene! Made me stop and look closer. Very cool shot. I love how you kept all the white for highlights. The horse's eye is also a very effective inclusion. WOAH! Love this one totally!!! this amazing! the colours are gorgeous! what medium did you use? This is amazing!!! Your use of color did an excellent job making the nazgul and his horse look very chilly and ethereal! 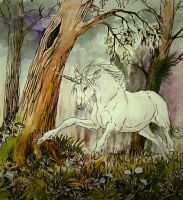 Are you planning on doing more paintings from Tolkien's stories?.... I would love to see you do a painting of Mirkwood from The Hobbit!